A CHEF has devised an unusual way of bringing his barbecued delights to customers – hauling two 100kg ceramic cookers in the back of an old London taxi. Andrew Brown, from Darlington, bought two Big Green Egg barbecues to indulge his passion for that method of cooking. The 48-year-old set about thinking of ways to use them as a source of income and hit on the idea of having them built into a former taxi. He bought an old TX1 taxi – with more than 370,000 miles on the clock – at the end of its 15-year service on the streets of London. Mr Brown said: “They weigh about 100kg each, so moving them about is no mean feat. “I was doing a private cooking job in London and there was a catering and hospitality show. “The company that imports the Big Green Eggs was showing and I went to meet with them. 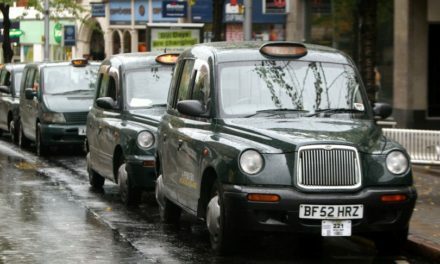 “They have converted two or three taxis and I thought it was a brilliant idea. Mr Brown, who used to run a restaurant, in Darlington’s Grange Road, is currently fine-tuning his business, The Barbecue Cab Co. He plans to take his distinctive vehicle to food fairs, festivals and shows, as well as being available for private functions. Is The Future Of Technology Taxi Shaped?